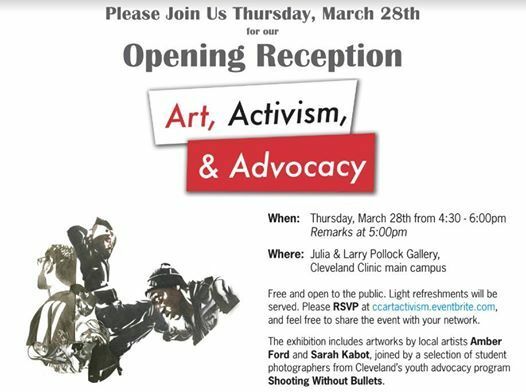 Join us Thursday, March 28th at Cleveland Clinic for the opening of Art, Activism & Advocacy -- a group exhibition featuring selected work from Shooting Without Bullets photographers alongside Cleveland artists Amber Ford and Sarah Kabot. 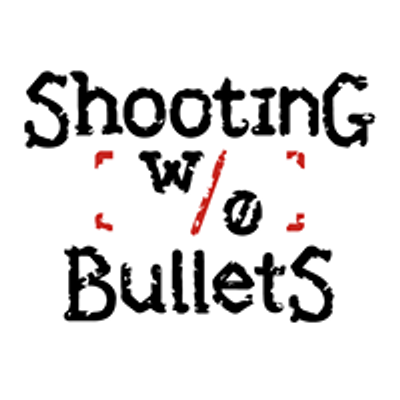 Art, Activism & Advocacy initiates a conversation about art's changing role in our contemporary world. More and more, artists are using their artistic practice as a form of activism, turning their artwork into prominent statements of advocacy for themselves, their local communities and broader global populations. Cleveland artists Amber Ford, Sarah Kabot, and a selection of student photographers from the youth program Shooting Without Bullets are all turning their lens toward some of the biggest social issues facing our communities and our nation: race, immigration and the ways in which consumers receive and process news media. Bringing these works together at Cleveland Clinic allows us the opportunity to reflect inward, and to encourage an open dialogue about issues that are directly affecting patients, visitors and caregivers—both within and outside our walls. Free and open to the public. Light refreshments will be served. Please RSVP, and feel free to share the event with your network. 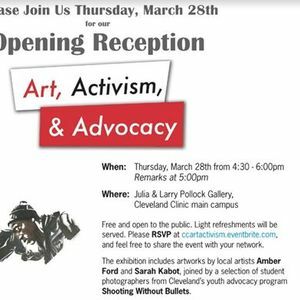 The exhibition includes artworks by local artists Amber Ford and Sarah Kabot, joined by a selection of student photographers from Cleveland’s youth advocacy program Shooting Without Bullets. Self-park in P1 Garage, E. 93 St. between Euclid Ave. & Chester Ave.
or Valet at J Sydell & Arnold Miller Family Pavilion, 9500 Euclid Ave. Enter at Main Entrance, 9500 Euclid Ave. Follow signs for the G Building. The Julia and Larry Pollock Gallery is located between the G and Q Buildings, near the Joseph Beth Bookstore and Key Bank. For more information, inquire at Main Entrance Desk.